Next year I'll plan to participate in The Cornell Lab of Ornithology NestWatch project. I invite you to join me! This afternoon on my walk back to work from my lunch break at home, I determined to remove the finch nest on the fireplace vent of a home we recently sold. I stepped up on to a chair to look into the nest to make sure the house finch chicks had fledged last week. They had successfully fledged, but there are already now a few more eggs in the same nest. This is the fourth brood attempt at the same location. 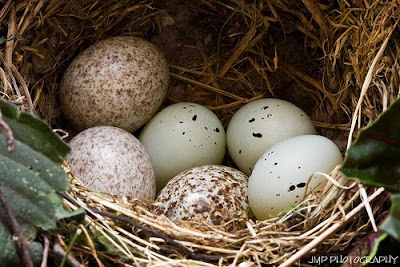 Two sets of eggs have hatched while one set of eggs was destroyed by a predator. I believe the first set of hatchlings were also taken by a predator as they were gone well before they were fully developed. I decided to check all the coniferous trees along the back of the model homes and I discovered three more active finch nests with eggs or recently hatched chicks. In the little pine behind our sales office back door there is a third finch nest with eggs. Amazing! I also found two more Robin's nests with chicks and eggs in the deciduous trees. In just about every small pine tree along our greenbelt you'll find an active finch nest. We have a Barn Swallow nest with eggs in the entry of one home. I prevented the nest from being built above the door of another home. I have observed Say's Phoebe's and Western Kingbird's gathering nesting materials. I know one pair of Say's Phoebe's already successfully nested on the light behind the Avimor Water Reclamation building, but it looks like they are building another nest somewhere. I am not sure if it is the same pair or another. 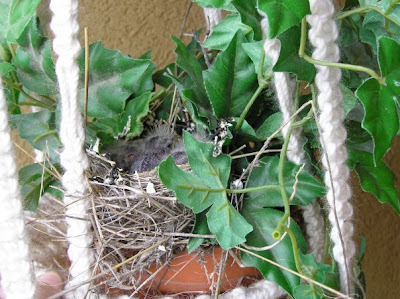 It appears the Bullock's Orioles have hatched as I see mother Orioles taking food to the hanging sock nests. The mother Swainson's Hawk sits steadily on her eggs. She occasionally cries out and the male brings her a snack. Avimor resident Shon Parks and his son Ian observed a Common Nighthawk last night. They were up on one of the hills when they saw it. They report that they were close enough to hear the sound of the air through its wings. 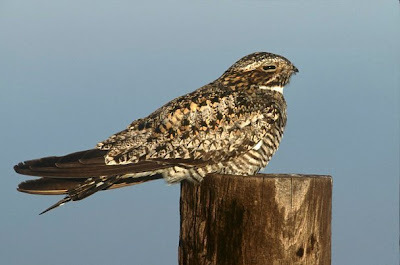 The male Common Nighthawk has a dramatic booming display used during the breeding season. He flies around at a moderate height, then dives straight toward the ground. Somewhere just about two meters from the ground he turns upward. At the bottom of the dive he flexes his wings downward, and the air rushing through his wingtips makes a deep booming sound. The dives are directed at females, young nighthawks, intruders, and even people. This is the first official record of the Common Nighthawk on Avimor's life list. The long wings with the prominent white patch on the underside of the wing make this bird easy to identify. They are usually seen at dawn or dusk. If you are lucky, you might find one nesting or resting on the ground, on a branch perched parallel, on a power line, or a post. 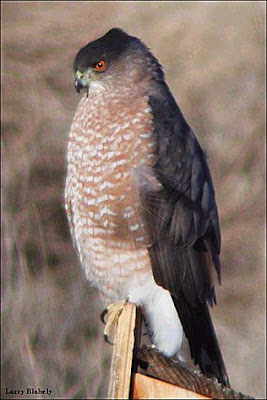 In spite of its name, it is not a hawk at all. I was delighted to welcome reknown Idaho birder, RL Rowland to Avimor this morning. We hiked along Spring Valley Creek Trail all the way to Cartwright Rd (trail #9 on the Avimor Trail Map) and enjoyed almost 40 species of birds. It helps to have a great birder with you to identify a few species that otherwise would allude a novice like myself. 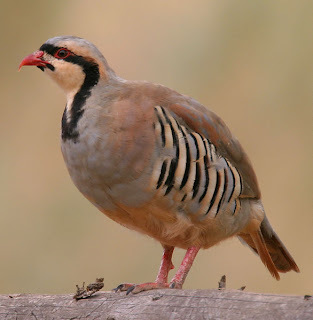 * some little baby chicks that we are pretty sure were Chukar chicks. 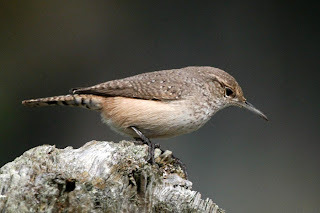 * three Canyon Wrens and at least a dozen Rock Wrens. Now I am sure that these birds have been to Avimor before, but this is the first time that I have seen them and made an official record of their presence. On Saturday, we observed the Eastern Kingbird. I have seen at least one every day since. 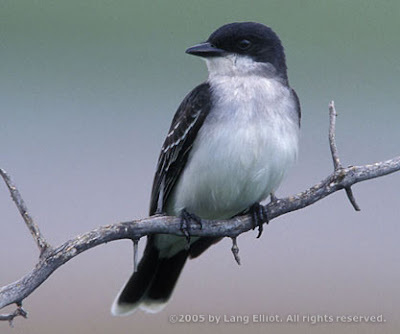 The Eastern Kingbird is pictured at the top of the previous blog post. During the Saturday bird walk, we walked past my home and we observed a House Sparrow feeding on the seed on my patio. 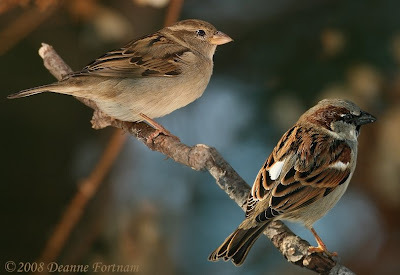 "The House Sparrow was introduced into Brooklyn, New York, in 1851. By 1900 it had spread to the Rocky Mountains. Two more introductions in the early 1870s, in San Francisco and Salt Lake City, aided the bird’s spread throughout the West. 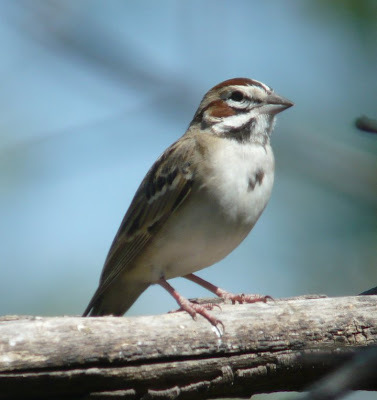 House Sparrows are now common across all of North America except Alaska and far northern Canada." (All About Birds). I suppose as we add more homes and buildings we will get more and more House Sparrows. 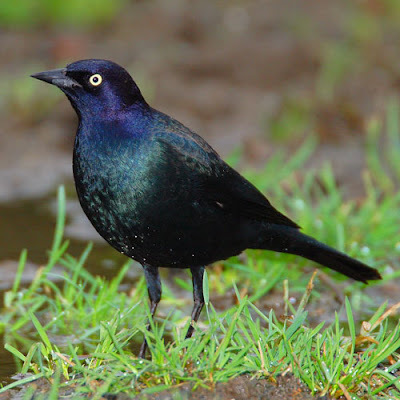 I regularly see Brewer's Blackbirds, with their distinct yellow-eye along the side of Highway 55 around Shadow Valley Golf Course and this morning I saw a male and female pair feeding on the walk and grass around Avimor Town Lake. 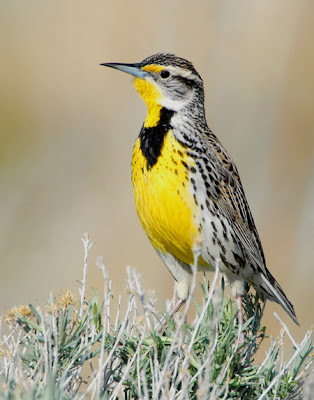 With experience, a birder goes from "identifying" birds to "recognizing" them. When it comes to the Flycatcher family, I am still in "identifying" mode. I have to make notes of the field marks of each bird, and then look in my Sibley's Field Guide to figure it out. Several flycatchers in the Epidonax genus are so hard to tell apart looking through binoculars that their unique sound is often the only way. I've been pulling out my Zune MP3 player recently with the BirdJam software on it to help me. 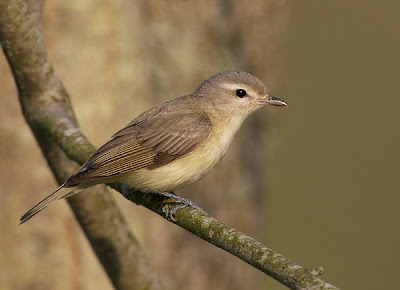 So far at Avimor I am pretty confident in "identifying" Western Wood-Pewees, Willow and Dusky Flycatchers. I now "recognize" the call of the Western Wood-Pewee very well. Check out these tips to identifying Idaho Flycatchers. 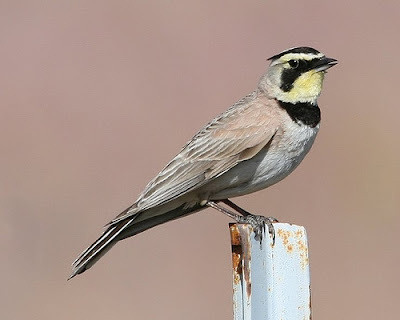 Click on the name of the bird to go to All About Birds where you can also listen to the calls they make. Western Wood-Pewee Willow Flycatcher Dusky Flycatcher Hammond's Flycatcher Gray Flycatcher Other Flycatcher's you may see regularly in Idaho are Say's Phoebe, Western Kingbird, and Eastern Kingbird. Less frequently you may spot a Cordilleran, Pacifc-Slope, Ash-throated or Least Flycather.